Over 1.8 Billion Flash MCUs Shipped! 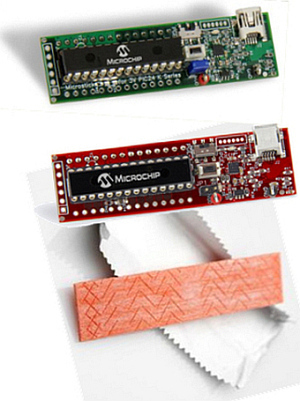 PICmicro microcontrollers (MCUs). A wide variety of 8-bit microcontroller families - PIC12, PIC16, PIC18. 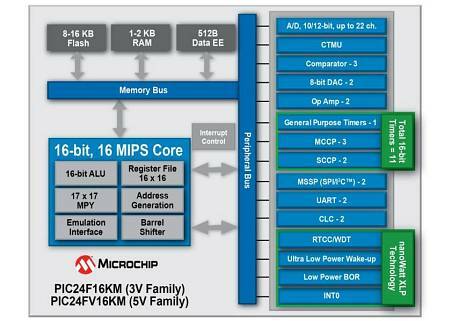 Popular PIC24 16-bit microcontrollers, also PIC32 32-bit microcontrollers. 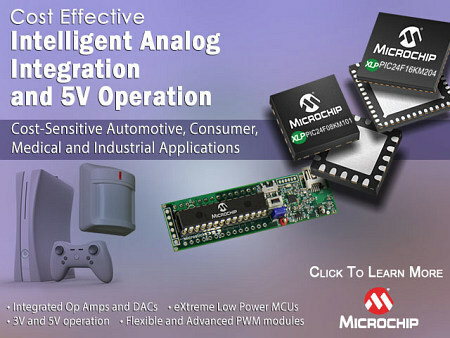 Analog/interface products; Serial EEPROMs; microID RFID tags; KEELOQ security devices; and the dsPIC family of Digital Signal Controllers. Excellent Development Tools. Microchip had shipped their One Billionth Flash Microcontroller by June 2005. Performance, Power, Pricing - Anything is Possible! Use the Configurable Logic Cells (CLC) to amaze your boss and build your own on-chip peripheral. You have four input gates, that can select from 32 on-chip signals, that you can connect to one of eight logic cells, to control your output. Oh, there’s two CLC’s on each chip, so go crazy and build something. Want to do Motor Control? Code and easy-to-use motor control circuit diagrams available at the Microchip website. Want to manage a Capacitive Touch-Screen? Code and easy-to-use touch screen circuit diagrams available at the Microchip website. Sleep(); instruction: CPU and peripherals shut down except the watchdog. Nightie-night! Details and code samples in the datasheet. Two Configurable Logic Cells (CLC) - like having an FPGA on-board! 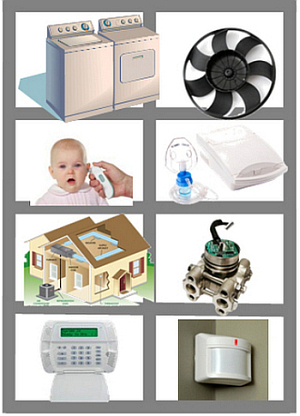 Building Safety & Security systems? It's about the size of a stick of gum and it's a complete hardware development platform for the PIC24F16KM family. Low-cost, simple to learn, easy to use. The free MPLAB IDE controls and programs the Microstick. Microsticks are little USB-powered development boards and include an on-board debugger/programmer, a DUT socket for easy device swapping, a nice LED, and of course a reset button. Insert Microsticks into any prototyping board for fast I/O expansion. Three rows of pins on the bottom of the Microstick can be plugged into a prototyping board with support for both SPDIP layout (300 mils) or wide PDIP (600 mils).